One of the joys of summer is to step out of my door to pick fresh herbs from the garden. The bay tree, kaffir lime, curry tree, rosemary and sage are in pots that we bring inside to use during the winter months. Basil and Italian flat leaf parsley are among my favorite herbs and I use them often in my cooking. Sadly, we haven’t had much luck with potting them and holding them over during the winter months. 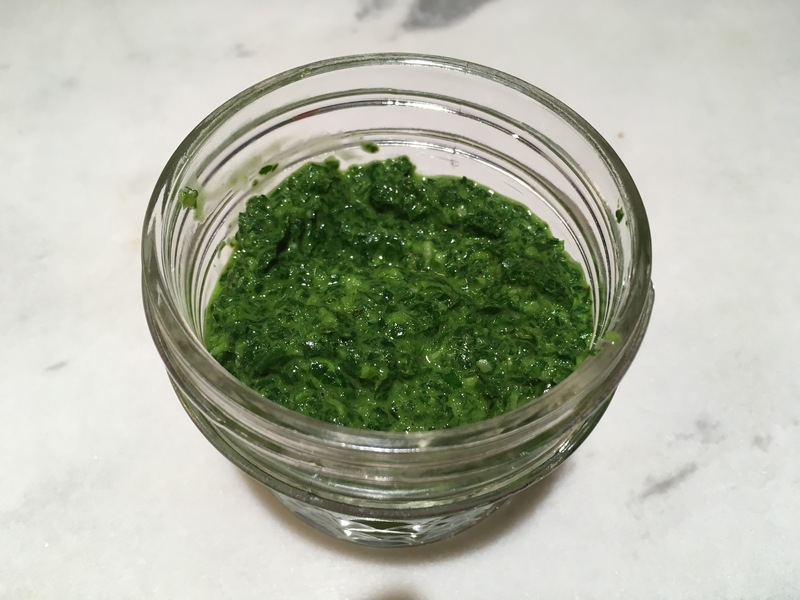 One of my favorite ways to preserve their fresh flavor is to make a purée of basil, parsley, garlic and olive oil. Then spoon it into jelly jars and freeze. During the winter months, I defrost a jar and toss a few spoonfuls into simmering tomato sauce, soup, or pasta with vegetables. It adds a nice herbal freshness to our dishes. You can also use it as a base for pesto. Begin by carefully washing the basil and parsley. Place on paper towels to dry and absorb excess water. In a food processor combine herbs with the rest of the ingredients. Purée until fairly smooth. Spoon mixture into 2 (4 oz.) jelly jars leaving 1/2-inch of space at top of the jar. Pour about 1 tablespoon of olive oil over purée to cover it. Wipe rims and screw on lids. Freeze. Best used within six months. Makes 1 cup. This entry was posted in Pasta, preserving, Sauces, Vegetarian. Bookmark the permalink.